360Works MirrorSync is the fastest and easiest synchronization tool for FileMaker. It allows everyday FileMaker users the power to synchronize their FileMaker Server files with FileMaker Pro, FileMaker Go, other FileMaker Servers, SQL databases, and most recently in version 3, Salesforce and Amazon Redshift. MirrorSync was awarded FileMaker Solution of the Year in previous years and the product continues to be known for its scalability, reliability, speed, and ease of use. Noticeably faster insert operations to FileMaker Server for large batches of records, e.g. during server-to-server syncs. Faster sync configuration, especially for large numbers of tables. MirrorSync with FileMaker Cloud allows users to work on their own offline copy of a database on their iPad, iPhone, or laptop computer, even when they have slow or no connection to the Internet. It can also be used for server-to-server syncing between servers in different locations and with other distributed server models (i.e., clustering, load balancing). Setup is still simple and does not require an installer when using with FileMaker Cloud. Updated documentation is available at the 360Works Documentation Wiki. Getting started with MirrorSync for FileMaker Cloud is extremely simple: There's nothing to install! 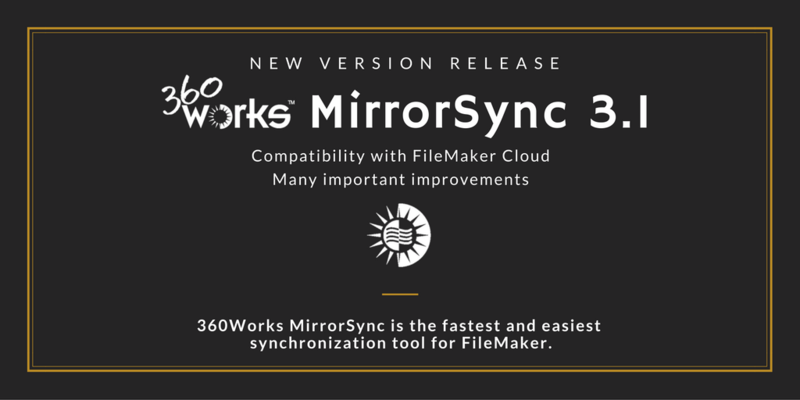 Once you've launched your FileMaker Cloud instance, 360Works can host MirrorSync on a managed AWS server for just $29 a month (in addition to regular MirrorSync licensing). There are several other approved hosting providers willing to host MirrorSync as well. Alternatively, knowledgeable Linux administrators can host on their own Linux instance with Amazon Web Services. Users running regular FileMaker Server on a Mac or Windows computer can install MirrorSync 3.1 on their own server. We've designed MirrorSync to be something that even a novice user can integrate, but we're standing by when you need more advanced help. If you just want your sync integration to be completed as quickly as possible, we're available to do the work for you directly at our hourly consulting rates. Existing MirrorSync 3 users can now upgrade to MirrorSync 3.1 at no additional cost. For users new to MirrorSync and MirrorSync 2 users, there's never been a better time to get your copy of MirrorSync 3 to take advantage of the new FileMaker Cloud computing technology. MirrorSync 2 users can upgrade to version 3 at 40% of the MirrorSync 2 retail cost. As always, MirrorSync is completely free to sync FileMaker Server with FileMaker Pro or FileMaker Go for one device. Free 14-day MirrorSync server-to-server configuration trials are available upon request. Please contact us to request your free trial today!